Are you looking for a dish that will impress your friends or family but is surprisingly easy to make? 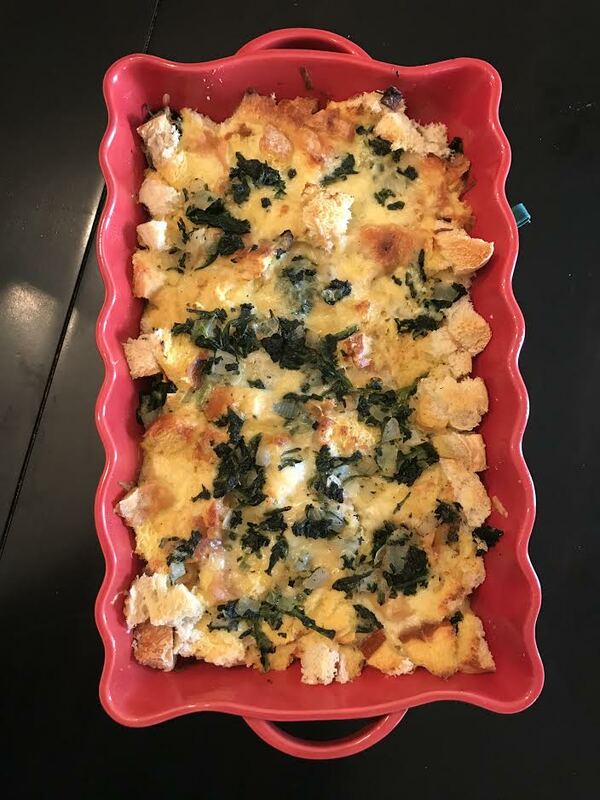 Our spinach strata recipe is just what you’re looking for! Strata are a variety of American dish. It’s layered and typically contains eggs, bread, and cheese. Can you really go wrong with bread, eggs, and cheese? We don’t think so! We’ve also added some spinach, a veggie that perfectly complements those main ingredients. Plus, the spices we’ve chosen will give it an almost sweet flavor but still bring out the flavors of the other ingredients. If you want to learn how to make our strata from scratch, follow our easy recipe below! Allow your spinach to thaw. Squeeze as much of the juices out and then chop finely. Set the spinach aside. Melt the butter in a large skillet over medium heat. Add your onion and saute until tender and fragrant. Add 1/2 teaspoon salt, 1/4 teaspoon black pepper, nutmeg, allspice and garlic powder. Stir and cook for one minute to evenly combine the spices. Stir in the spinach, then remove the skillet from the heat. Grease a 3-quart casserole dish. Spread 1/3 of your cubed bread in the bottom of the dish. Cover the bread with 1/3 of the spinach mixture. Sprinkle 1/3 of both types of cheese over the spinach mixture. Repeat step three to build two more layers, with shredded gruyere and cheddar on the top. Set it aside. In a medium bowl, combine the milk, eggs, Dijon mustard, and remaining 1/2 teaspoon salt and 1/4 teaspoon black pepper. Whisk the mixture until all of the ingredients are well combined. Pour the egg mixture slowly into your casserole dish, evenly covering the layers of bread, spinach, and cheese. Cover the casserole dish with plastic wrap and store it in the refrigerator overnight for about 8 hours. Letting it sit overnight allows the cubed bread to fully absorb the liquid eggs. Once your strata have sat overnight, take it out of the fridge. The strata should sit out of the fridge, but not on the stovetop, for 30 minutes before baking. Once the oven is heated and the strata have sat for 30 minutes, bake them for 45 to 50 minutes. You’ll know they’re done when the top has puffed. When the strata are done, let it sit for five to 10 minutes. At Sauder’s, only the highest quality and freshest eggs will do. When you’re preparing to use this recipe for cheese strata, be sure to use Sauder’s eggs. To find our top-quality eggs at the nearest shop to you, please use our store locator today.